Now that's a good question. What is creativity to you? Take a minute to jot down five or more answers that crop up. Then watch this, from Hour of Code. Hour of Code first began in 2013, during Computer Science Education Week. That first week in 2013 was December 9 to December 15. 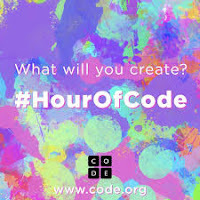 An inspiration from Code.org, Hour of Code started as a challenge to teachers, schools, students, and parents alike to take the "Hour of Code Challenge," trying out coding for just an hour. With their programs and tutorials, they showed that anyone could do it! Try your hand during this year's 2018 Hour of Code week--December 3rd through 9th. Here are a number of options and places to start on their Hour of Code website... where you will find over 200 one-hour tutorials & interactive in one of over 45 languages. Be a part of this global movement!